related partly also to the theme "Trionfi"
"At the 29th March 1436 is a short list of work done for the joiner, picture framer and engraver Guido Castellani, including a Torchiolo da carte", writes Ortalli in his "The Prince and the Playing Cards". "The small press is the first evidence of the Este court's dealings with manufactured playing cards as opposed to entirely drawn and hand-painted cards." Ortalli assumes, that already earlier cards painted by Sagromoro had been partly printed, but now he sees, that "the press for making cards was purchased directly by the Este." In the entries appears a mysterious "Mantovano", which seems to be the printer, obviously somebody from Mantua. The Mantovano is still active in printing business 1452, when he had to print Imperadori-cards: "stanpire charte da imperaduri da zugare". In 1436 he is mentioned in the sentence "commissioned at your behest by the Mantuan" (commesse per Vostra parte lo Mantoan) (Francesschini 1993, p. 178, n. 412f.). Mantua is not ruled by the Este, but by the Gonzaga-family. To these informations we found the following background interesting enough to be mentioned, considering, that for the years of the 1430ies it might have been true, that methodes of playing cards production were much better developed in Germany than in Italy generally. The Emperor Sigismondo gave to the Gonzaga-family the title Marchese at 22th of September 1433 during his 2-years-visit in Italy. At this opportunity he was crowned to a king of Lombardy in December 1431 in Milano and crowned as Emperor in May 1433. The Emporor didn't come alone of course, he was accompanied by 100s of persons in minor function. Such Emperor visits caused strong expenses for the visited cities, but they also offered a lot of good opportunities to take up new cultural influences. Talkings about smaller businesses in the background was a natural result. It seems, that Mantua earned - beside the title Marchese for the reigning Gonzaga - the "printing connection" from the visit and also the hand of the 10-years-old Barbara von Brandenburg, the niece of Sigismondo, for Ludovico, the espected heir of Mantua (the "theoretical" marriage took place 3 monthes later). The marriage decision should have established immediately an influential and promising link between the courts in Germany and Mantua (= Northern Italy). Frederico I., the successor of Ludovico the Turk, marries in 1463 Maria of Bavaria. The marriage endures 15 years. 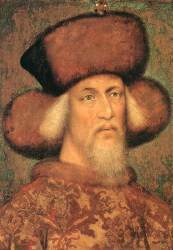 His sister Barbara marries Eberhard I, duke of Wuertemberg, 1474, the marriage endures 22 years. It spreads many influences of the Italian renaissance in Germany. Another sister marriage of Paolina also seems to have been Germany-related. 2 Gonzaga-generations later the Gonzagas do unite with Montferrat (1531), a heiress is married. The Montferrat region might have had some German influences. Another Gonzaga-generation later two important marriages (1549 + 1563) are done with female descendants of Austria, also German-talking. The development started in 1433, it is earlier not reflected by marriages. From this one might consider German influences by the Gonzagas on other Italian families, also one might assume some bilinguality in the Gonzaga family. The first, who might have caught some effects of this new development in detail outside the Gonzaga-court, should have been Leonello d'Este. 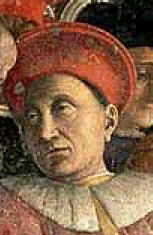 He married Margaretha Gonzaga, sister of Ludovico the Turk in 1435. Inside this marriage-scene we can now observe the detail of a printing press in Ferrara in 1436/1437, somehow connected to a mysterious person called the Montuano - who must be capable to print playing cards. 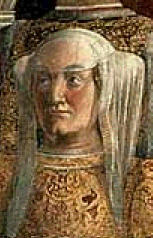 In 1437 Lucia d'Este, one of the Parisina-twins, married Carlo Gonzaga, the brother of Ludovico, a second Este-Gonzaga connection. However, the actual case seems to have been rather complicated. Probably in 1436 Barbara von Brandenburg is "really" in Mantua, together with a German servant. Something must have been rather unpleasant to her husband, the Gonzaga heir Ludovico. He flees to Filippo Maria Visconti in Milano, November 1436. His father is very furious and now his brother Carlo becomes the new heir. In this role he marries Lucia d'Este spring 1437 - who rather immediately died after the wedding. Then a new Milanese-Venetian War breaks out and often one, two or three Gonzaga men are on the battlefield, not always for the same party. And generally Mantua changed inside the war the sides from Venetia to Milano. Details: in the Gonzaga-biography. The dramatic development of the year 1436/1437 is followed by "Carlo Gonzaga being marriage-aspirant for Bianca Maria Visconti" (when Mantua at the side of Milano), then "Leonello being possible husband-in-spe for Bianca Maria in winter 1440/1441" and "Francesco Sforza finally marrying Bianca Maria in October 1441" as it was already promised to him 1432, when Bianca Maria was 7 years old. Later it is stated, that Carlo and Ludovico lived as hostile brothers - we don't know the precise reason for this antipathy (perhaps we just didn't find the right book, the Gonzagas were only peripheral for our studies), but probably it relates to emotions builded in these deciding years "printing-press years" 1436/1437. Ludovico became Marchese of Mantua in 1444 (he had reunited with his father a few years before) with the death of his father and in 1459 the host of the congress in Mantua and the same year maecen of Mantegna, who painted him and Barbara von Brandenburg in a grandious fresco. Barbara (* 1423) became a letter friend to Bianca Maria Visconti (* 1425), they were in the same age. Perhaps that might relate to a meeting between the both in this communicative winter 1440/1441? We've no news of this, but the distance between Mantua and Ferrara is only ca. 70-80 km and all could have been done with a ship. It was Bianca Marias first stay outside of home, is it imaginable, that they did let the good opportunity pass away to build friendly connections, which might later influence questions of peace or war? Carlo became an adventurious condottieri. He belongs to the many, who tried to become duke of Milano in 1447 - 1450, again it was Francesco Sforza, who was the final winner. In December 1456 he died. Between all this confusing informations appears the innocent printing press in 1436, and the assumption, that it is a German card printing-press somehow connectable to the visit of Sigismondo looks suggestive. Personal Comment: I think, the mentioned printing-press is a relatively new invention for the Italian market, surely there were other German printers before in Italia, but I guess, that they couldn't afford to keep uptodate with new developments of printing technics in the meantime in Germany. The printing press doesn't appear accidently in Ferrara: it relates to the good Gonzaga-Este-connections in this time. Import to Italy of culture from north of the Alps has various examples: Music technology, oil-painting, old manuscripts. The son of Leonello, Francesco, were perhaps send to the court of Burgund to gather such insider-know-how. A similar action is done around 1460, when Bianca Maria Visconti sends a painter to Rogier van Weyden to learn - but this guy, who caused some trouble by drinking too much (Bianca Maria had to write letters of excuse to Rogier), later makes in Milano other things, which were often parallel to the work of engravers (there are relations between Rogier van Weyden to Tournai, and that's a playing-card-production center probably since the mid 20ies). The role of the Sigismondo visit, which happened also during greater political turbulences, is discussed at another place. The Chapter "Playing Cards - Documents and Articles" presents specific material to the situation of playing card development in late 14th and 15th century.